Recently, on the wonderful blogs, Wearing History and It'll Take the Snap Out of Your Garters, some interesting vintage-related topics cropped up that I thought I would take up again here on my own little blog. One of the subjects related to the humorousness of unfortunate vintage loving folks showing up at vintage re-enactment or vintage society-type evening gatherings wearing what they think are 1930s evening gowns that are actually either dressing gowns, hostess gowns, or even nightgowns or slips. What I noted there is what I will note here: assuming these folks were not trying to be avant garde or deliberately just doing their own thing (which I personally respect), buyers of vintage certainly may want to make sure they know the difference between these types of items (especially 1930s-40s varieties of these) if they are wishing to be historically accurate and especially if they want to avoid paying a pretty penny for an item they think is a Jean Harlow evening gown when it is actually a nightgown etc etc. I say this with full awareness that, in my humble opinion, telling some of these items apart can be very very tricky. 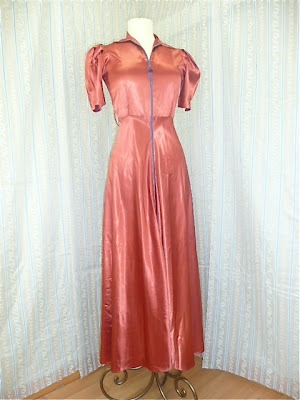 HOWEVER, as I will also again reiterate, vintage SELLERS (myself included) need to stay on top of their products and do their very best to ensure they are not misleading customers into thinking what they are buying is a "Jean Harlow" evening gown when actually the item is a vintage slip or nightie!!! Now, no one is perfect. I openly admit that I am relatively new to the vintage buying game and there's lots of info to learn about when it comes to vintage clothing. BUT I try my darndest to make sure I am as close to possible in terms of accurate date or provenance as possible...and if I don't know, I ask, I research, I admit as much in the listing. (That reminds me, if any of you vintage or textile experts out there ever see anything in my shop that you don't think I've described correctly in terms of decade or fabric or whatever, I'll always appreciate a courteous convo through my shop to that effect!!!). Now, back to the point above: lest you think this type of mis-listing is not going on as I type this, I have some images to show you of items being sold on Ebay and Etsy right now. Before I do, though I want to state that I'm not including links to the sellers, as my goal here is not to be a Ms. Smarty Pants know it all or to "tell" on other sellers; in fact, if you are a seller and I've showcased one of your garments here, please know that I am not trying to humiliate you. I just think it's useful to show some examples of what both buyers and sellers may want to try to be more aware of when dealing with these types of garments. Okay, have a look at the images below...all of these items are being sold right now to the public as "1930s gowns." One of the listings for one of these does go on in the body of the description to admit it might be a night gown. So, just for fun, I am going to pose the following questions: Are any of these items actually 1930s evening gowns? If so, which one is the evening gown or which ones are evening gowns? Which are nightgowns? Hostess gowns? Dressing Gowns? How can you tell? What aspects of fabric, detailing, etc, would you say leads you to your conclusion? Stumped? 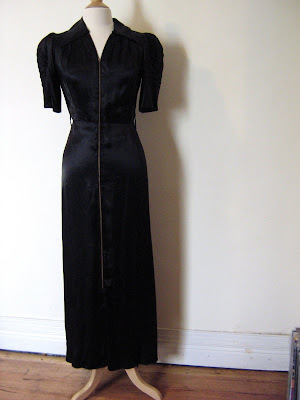 You're not alone; Here are some tips I hope Lauren from Wearing History doesn't mind I copied from her blog for what to look for when trying to figure out the difference between a 1930s evening gown and other types of gowns (esp. a hostess gown and a nightgown). "If it's satin, got trapunto on it, and a big zipper up the front it's NOT an evening dress. Just because it's cut on the bias doesn't make it an evening dress either. If it's peach, got little flowers on it, and has ties at the waist your best bet is nightgown. Especially if it's got a tag in it saying the bust size." Any other tips or tricks for garment identification? Stay tuned....I'll try to reveal the actual identities of the above garments in a little while. I just watched MY Man Godfrey again with Carole Lombard, the items of clothing she talks of as "my pyjamas" are out of this world! OOOh, so EERY, AbleGrable! I JUST bought the remastered version of My Man Godfrey in COLOUR today!!! You're right--it really shows how confusing the line between pyjamas and evening wear really was in the 30s. I swear I could wear my one 30s peignoir set out as an evening look and the average modern passerby wouldn't bat an eyelash it looks so evening gown-y. The colors are a bit light and pale, but still. TRICKY! 2 & 5 are housecoats/robes, I have a long zipped housecoat myself and it is fantastically comfortable, but long zips are not evening gown chic! Oh those are all so lovely, especially #3! That's interesting. I wonder if there is a book, website or series of books out there with information on identifying vintage of different eras. I saw an illustrated book of styles from different eras for adults at my library, but it wasn't exactly what I was looking for. If you know of something like this, would you pass it on? Miss Rayne knows what's what!!! Kelley Anne, I know of several titles and could certainly do a post on the. A really affordable book that looks at the main distinctions between fashion of the 20th century is called Vintage Fashion: Collecting and Wearing Designer Classics, foreward by Zandra Rhodes. Definitely, vintage sellers and buyers should know the defining features of items from various major decades. However, in this instance, what seems to be an issue is people misidentifying items from within the same decade (i.e. not being able to know diff between 1930s evening gowns and 1930s nightgowns, for example). There are several good books that delve more deeply into individual decades, but I must admit I'm seeing more recent good ones for the 1940s than the 1930s: HIGHLY recommend Jonathan Walford's Forties Fashion, for example. Anyone else got some titles to recommend??? Zips = housecoats. The others are nightgowns. The pastels, lace trim, and lightness of the satin all = nightgown. Pretty though! whoa, Andi! I am really tempted to message an Etsy seller who is right this minute selling a 1970s does 30s polyester dress as a "1930s evening gown," but don't want to rabblerouse...?! I'm a bit behind here, but I just remembered about that scene in Shadow of the Thin Man, when Nora tells Nick to pick out a dress for her to wear and he says, "Here, this one is my favorite" and she says: "Why, Nickie, that's a nightgown, not a dress!" Then in So Proudly We Hail, Paulette Goddard wears her black nightgown to a party (in Paulette's defense, there were extrodinary circomstances involved and she does try to make it look less like a nightgown).